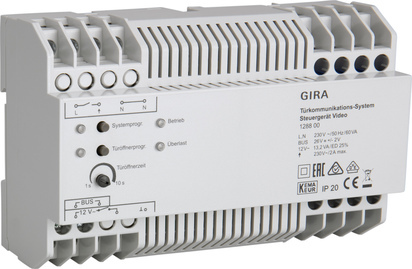 Control device for supplying power to the audio and video components of the Gira door communication bus. Supply of the reverse-polarity protected, short-circuit-proof 2-wire bus when using video components such as a colour camera and/or TFT colour display. The video control device can supply power to up to 2 door stations with a colour camera and 28 home stations with TFT colour display. A total of up to 15 colour cameras can be activated by the video control device (5 door stations video and 10 DCS-camera gateways), of which two door stations with colour camera can be supplied with power by the video control device. The other colour cameras must each be operated with their own power supply for door communication. The video control device is intended to be installed in the sub-distribution, not for common surface-mounted distributors. When the topology of the video cabling is designed as a branch line, the video distributor is also required. In combination with the DCS-TC gateway, the power supply for door communication is required. This video control device enables door communication systems with up to 70 audio devices to be established (e.g. 1 x built-in speaker, 5 x add-on modules for built-in speakers, 68 x surface-mounted home stations).